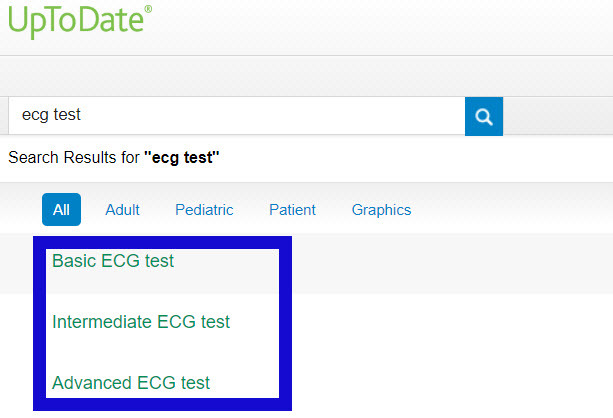 From the list of results, choose one of the ECG test topics (for example, "Intermediate ECG test") by clicking on the title. Try to make an accurate diagnosis based on the strip, then close the window. To see if your diagnosis is correct, find the Graphics section on the left side menu. 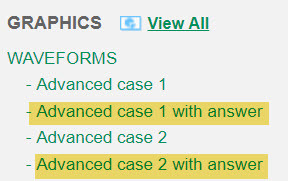 You can access the case answer keys here. The text on this page was originally copied word for word from the UptoDate support site. This document has since been modified and is no longer on the publisher site, but the directions are still accurate as of 8/9/18.